> nevertheless find your "historical highlights"
> started work on a pyramid? No. I think the attribution of the mastaba to Shepseskaf is weak, but regardless all things considered it definitely appears contemporary with the pyramids of Giza. > didn't know he'd have so short a reign. 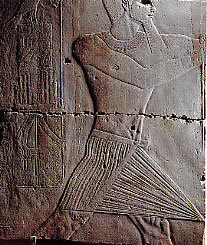 I think it is more likely this mastaba was built before he became king when he was still a prince. There is a large mastaba at Giza attributed to Khafre which would have been built when he was a prince as well. > adding the obelisk that once stood there. Yeah, this makes no sense. He had to have made an obelisk which is kind of what I was driving at being one of the "1sts" of the 5th Dynasty. They didn't find one and the one they did was from a few pharaohs later. He must have made one though. A tough row to hoe. > preservation is a better word-- project. > imo. Not the granite/basalt ones though. Kind of. What I see is that the Sphinx, associated temples, the stepped platform of G2, and perhaps some aspect of the core structures of the other 2 Giza pyramids predate the 4th Dynasty and perhaps, in one form or another, even the Dynastic period. I have yet to find the definitive proof I need, but I believe that the first builders at Giza were refugees from (or related to) Malta, which I date the monuments there considerably older, that settled in the Nile Delta after the disasters c. 6,000BC. I believe that they were wiped out shortly after, perhaps centuries or less, by the 2nd wave of disasters c. 6,000BC that completely flooded the Nile Delta. It is further possible that some of the work may have begun even earlier as there are 1st-3rd Dynasty tombs found at the edge of the Giza plateau in the south cemetery. At some point towards the end of the 3rd Dynasty/beginning of the 4th these core structures began to be converted into true pyramids. I suggest this pyramid conversion process was not the product of one pharaoh working on one pyramid at a time until their death then the next pharaoh working on another, but rather that some degree of the work was carried out simultaneously as part of an ongoing national/generational project. I think the discrepancy in the traditional timeline for the great pyramids being built in such a short time is partly resolved by this, and also helps explain what appears to be distinct phases in construction, of which I would put the granite builders as a latter phase. But also to explain this is that the work at Giza did not end with Menkaure at the end of the 4th Dynasty, but continued well into the 5th concluding sometime in the beginning of the 6th Dynasty. I would say that this last point is proven by the fact that the "tombs of the pyramid workers" do not belong to the 4th Dynasty, but rather the 5th Dynasty. 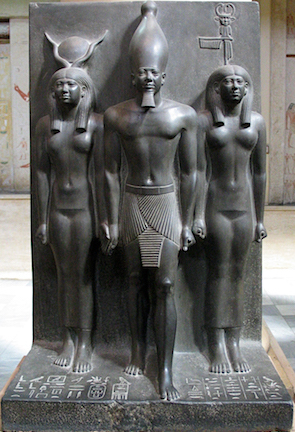 And not just the 1st few pharaohs of the 5th Dynasty, but all the way to at least to the 8th pharaoh, Djedkare Isesi, one of the few pharaohs mentioned in the nearly 5,00 hieroglyphs found in the workers tombs. And of note-Khufu, Khafre, and Menkaure, or any other 4th Dynasty pharaoh, at least from what has been discovered so far, are not even mentioned once. Hmm. At any rate, I do not buy into the idea the pyramids were built sometime before 10,000BC. This is a fantasy with no evidence to support it and everything against it and regardless is not necessary. The DE were not "squatters", but rather the inheritors of a legacy which they took, perhaps with outside help, to even greater heights. This is not the LC, it is the DE. And if they could make statues like this then what could they in principle not do? > power, but still I think it's an interesting idea. > the occupiers during the OK, etc.? (As a start) which I argue that this Mesopotamian influence was gruesome marked by the ritual murder of thousands of subjects which led to a revolt at the beginning of the 2nd Dynasty, a dark age in DE history. 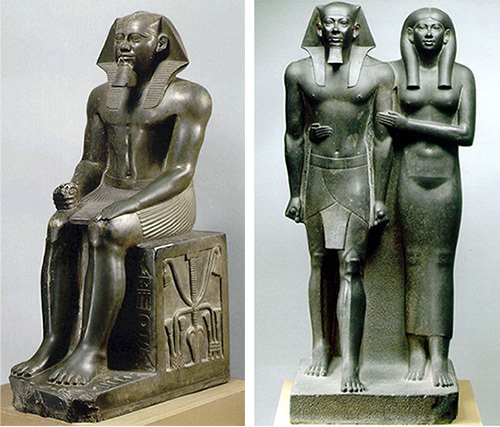 It was not until Khasekhemwy at the end of the 2nd Dynasty that Egypt is once again united in which we see again the beginnings of a rapid acceleration in DE material culture leading to the abrupt and unprecedented stone working construction industry of the beginning of the 3rd. All once again punctuated by a renewal of foreign interaction, namely Byblos and the Levant. Whether or not foreign influence played a part in all this there is no doubt, the question is to what extent. I believe it was a much more direct one and what I have been driving at the last several weeks in particular noting the extensive interaction with the OK and MK with the Levant is that this level of direct influence is nothing new nor unique, but rather part and parcel of DE history. > structures and statuary, perhaps? To the subjugators of the MK, like the Canaanites and Hyksos, or the NK like the Greeks, Hittites, Phoenicians, Romans et al-the OK was exceedingly ancient. When the Greeks first started living in Egypt by at least the 7th century BC, the 4th Dynasty was 2,000yrs before their time. By the time Alexander the Great conquered Egypt leading to the Ptolemaic Dynasties, Ramses II was nearly 1,000yrs older. How much more ancient does it have to be? If you need more there are more. These icons were made by the same people who made the statue which "must have been the LC because the DE could not make such things". Yet these "icons" are the standards, or "flag", of the various nomes of Egypt noted time and again from the beginnings of Dynastic Egypt. We see the standard bearers carrying the standards (flags), in principle just like the ones on the statues, of the various nomes that did battle for the king, a king with customary barefeet, buttflap, and white and red crowns. Is the Narmer Palette LC or DE? Also on the Narmer Palette we see buildings and fortified walls-the work of the LC or DE? I'll leave all of the Mesopotamian connections out of it seen here as to not confuse the issue, but the point is that if you think these were all made by the LC then they wore buttflaps when they were building the pyramids. Edited 4 time(s). Last edit at 01-Dec-17 16:57 by Thanos5150.